From time to time, I receive free products to test and I, usually, turn around and tell you guys about them. 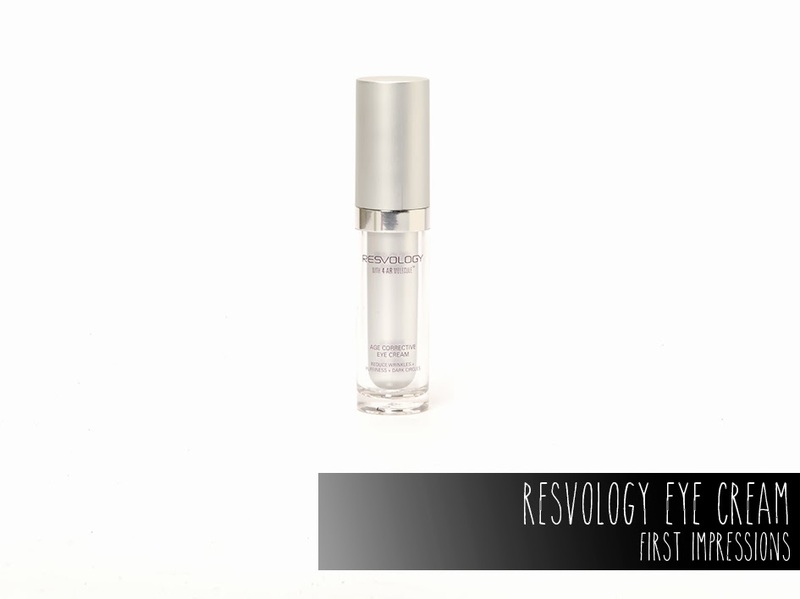 One of the more recent products that I've received is an Age Corrective Eye Cream from Resvology. I'm calling this a "first impressions" post due to the fact that I don't think you can accurately judge any anti-aging treatment (or really, any skin treatment) in a short period of time. I think that I would need to use this for months to be able to tell you if there were any difference in my skin. That being said, I can tell you what I think of it now and a little bit about the company. 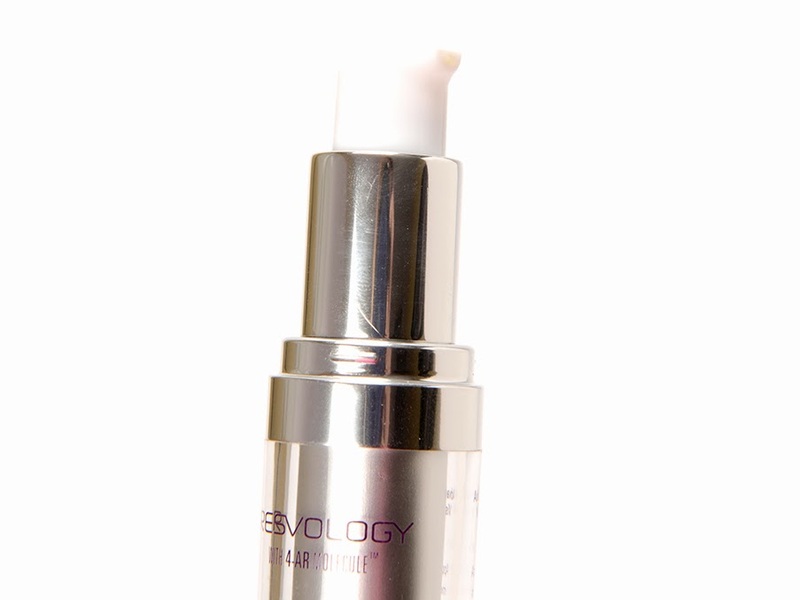 At Resvology, our dedication to advancing the potential of anti-aging skincare began in our research labs. Specialists in studying gene-activation, our distinguished scientists were awarded a medical grant to study the problems of aging skin from the National Institutes of Health (NIH) in Washington, DC. After 10 years of medical study and investigation, they isolated the power of the first ever stabilized form of resveratrol acetate, now called the 4-AR Molecule™ (US PATENT 7,714,161, with worldwide patents pending), a clinically-designed solution to help tackle specific aspects of skin aging including fine lines, wrinkles, loss of firmness and elasticity, uneven skin tone and sun damage. The only brand in the world to feature this transformative breakthrough, 4-AR is clinically-proven to help keep skin acting and looking younger. Generally speaking, I think that a lot of companies use "science jargon" to make their consumers believe that they are fancy and have spent a lot of time in research. That's not to say that Resvology hasn't spent a lot of time researching, but the description above doesn't sound like anything particularly unique to me. Hydrating and rejuvenating anti-aging eye cream infused with active peptides, botanicals and the multi-patented 4-AR Molecule™, clinically-proven to help fuel healthy gene activity by 330%. Safe for all skin types, this lightweight formula helps minimize fine lines, wrinkles and crow’s feet, improves skin firmness, deflates puffiness and brightens dark circles. What is our multi-patented 4-AR Molecule™?4-AR Molecule™ is the only stabilized ester of the widely recognized “youth-molecule” resveratrol. 4-AR Molecule™ was discovered when our distinguished scientists, specialists studying gene-activation, were awarded a medical grant to study the problems of aging skin from the National Institutes of Health in Washington, DC. After 10 years of medical research, they created the pharmaceutical-grade, multi-patented 4-AR Molecule™ -- a clinically-designed solution to help tackle specific aspects of aging skin. Again, I've only been using this eye cream for a short time, so I can't speak to a prolonged use of this... yet. I can speak a little bit more about the brand though. It does appear that Resvology is building quite a clientel and has partnered with several well know companies, such as Henri Bendel, to put on events. Not that Henri Bendel is the end all, be all of promoting skin care, but it is a boost of confidence in a company when brands partner with them. Since Resvology is fairly new to the scene, it's nice to know that they aren't some horribly shady company! As for the eye cream itself, here is what I can tell you about it. The packaging is very sleek looking and I like it quite a bit. To me, eye creams generally seem pretty unsanitary due to the fact that they come in a pot and you're constantly sticking your fingers in there. This comes with a nice little pump tube so that you never have to dip your bacteria laden fingers into a pot. The only perk to eye cream coming a pot is that you get to use 100% of the product and don't have to worry about anything being left over to the the inability to get it out. I tried to unscrew the top of this container, but it doesn't unscrew, meaning that there might be a teaspoon or more left in the bottle that you can't get out. The cream is just an off-white shade without any discernible scent, which is a good thing, because you wants to put fragrance right by their eyes? I don't even use a full pump when applying and although it says to use "day and night", I only use it at night. The cream itself is actually fairly lightweight and soaks into the skin fairly quickly without leaving much of a residue on the skin. If you have oily skin like me, that's a sigh of relief when it comes to anti-aging. After sitting on the skin for a few minutes, it's completely absorbed and leaves the skin feeling really soft. Since I use this at night, I can't speak to whether or not that feeling continues on throughout the day. All in all, it's an intriguing product and a company that I am interested in seeing more from in the next few months. If you're curious about Resvology, you can check them out at www.Resvology.com or on Facebook at www.facebook.com/resvology.